Was Home originally named Whoosh? 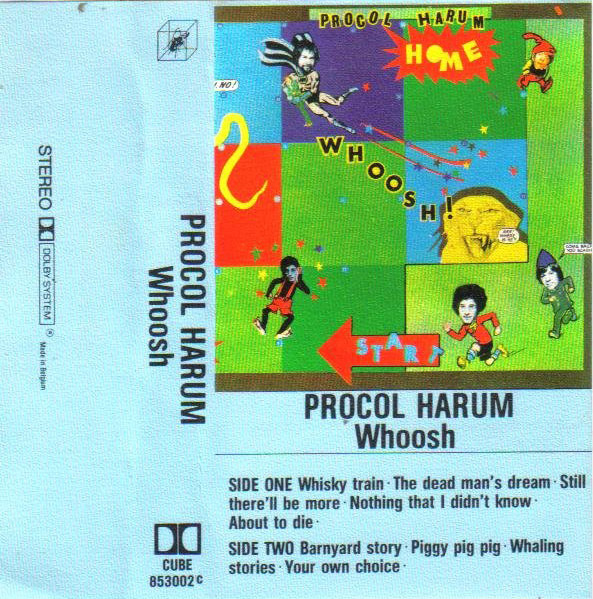 Did Procol Harum make an album called Whoosh? No, not really. But my Cube 853002 records release of the Home album actually says 'Whoosh' on the spine of the cover, and on the yellow label on the LP. On my Doubleback Home + Shine On Brightly reissue TOOFA 10-2, the spine still reads 'Cube records / Doubleback / Procol Harum * Shine On Brightly : Whoosh'. But the label on the LP – a brown cube label also marked with 'Manufactured and distributed by PYE Records' – says 'Home'. This is also reported by Mattias Oscarson. He and Jonas both live in Sweden. Maybe this only happened there? If you know more about this, please mail us. December 2009: Marc Suttle kindly sends these scans to BtP to assure us that "the Home album was also distributed in the USA as 'Whoosh"
Nice to see again those Home re-releases as being 'Whoosh'! Actually both the record and the tape originate from Belgium. You will notice that both tape and record have catalogue number 853002. On the tape inlay it states that the tape was made in Belgium, after the Dolby sign on the back. The tape itself was intended for the Dutch market (or produced in the Netherlands) hence 'Stemra' is used. It was at that time the organisation that controlled the author's rights and received the fees from anybody who played music in public places or on the radio. Dutch people will know the combination 'Buma/Stemra'. On the record label it says 'Sacem', I think, and that is the Belgian equivalent of 'Stemra'. I think that its British equivalent is 'MCPS' or perhaps 'Britico'. The tape of Home must have been an import one: in the USA it would have been released on A&M, not on Cube, and this is definitely the Dutch version. I think that both the record and tape date from the period that either CNR or BR-Music were licensed by Cube to release their catalogue. Looking at the number I think it was CNR. As a matter of fact I own this tape as well, just for the fact that a record company made such a grave error showing they didn't actually know what they were releasing … the tape is of a terrible quality and as such an insult to Procol Harum! 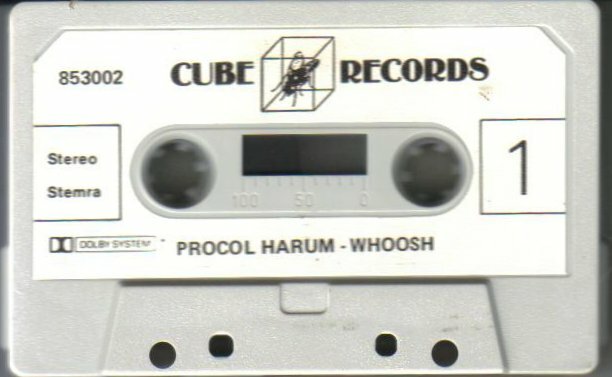 I think the title 'Whoosh' refers to sounds you hear when playing either tape or record.